How do scientists determine the weight of a dinosaur? It’s not easy to determine the weight of a dinosaur. Scientists can only estimate an animal’s weight by looking at the bones of the animal. One method of determining a dinosaur’s weight is by studying the cross-sectional area of a limb bone. This way, scientists can estimate the weight borne by the limb. But it’s not only the weight times four legs that results in an estimate; it’s also the position of the legs, the posture of the animal, the tissue and flesh on the legs, and the limb shape. Some scientists have tried to extrapolate the weight of a dinosaur by comparing the animals to modern living species, but apparently there is really no linear relationship between the two. 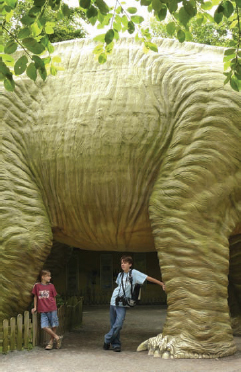 Kids visiting Dinosaur Park in Münchehagen, Germany, stand beneath a replica of the Seismosaur (iStock).